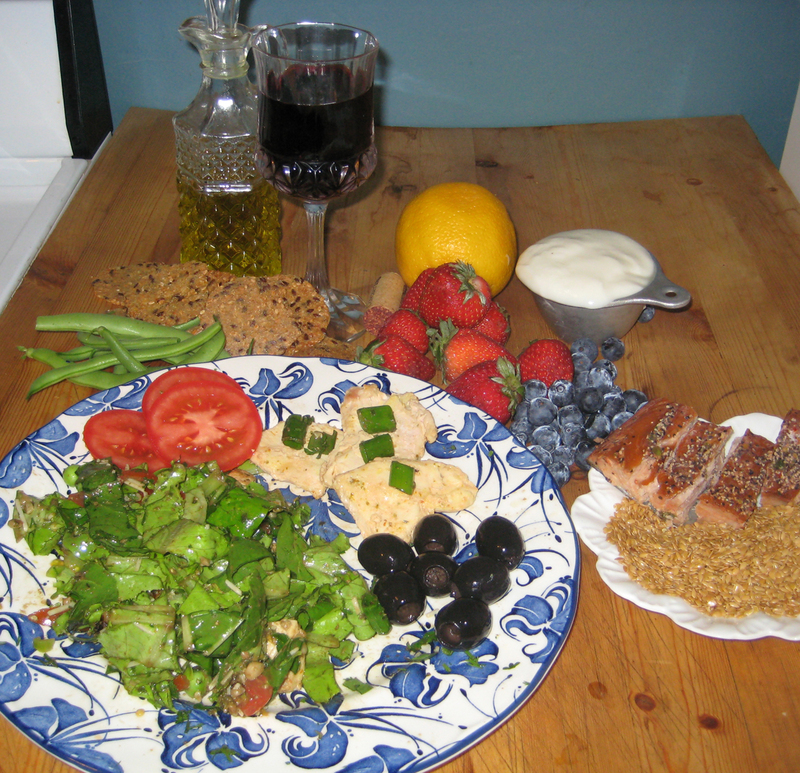 This is what the Mediterranean Diet looks like. I’m almost 2 weeks into the Mediterranean diet, and loving it. The Mediterranean Diet involves lots of fresh fruit and vegetables, chicken and fish, a daily quota of olive oil that must be met, a weekly quota of Omega-3 fatty acids in the form of salmon and flax, and a daily quota of whole grains. Dairy comes from low fat yogurt and milk. Garlic, onion and herbs are to be used liberally. This diet has been found to prevent type-2 diabetes, heart disease, stroke, many cancers, and even Alzheimer’s disease. I’m participating in a voluntary study at the University of Michigan that follows people on the diet for 6 months. So I am committed to the objectives of the study as well as my own health. Lots of motivation to stick with it, as well as personal coaching from a University nutritionist. At first, it seemed like too much food! I have to eat 2 cups of dark green vegetables, one cup of red vegetable, one cup of yellow vegetable and one cup of “other” vegetable each day. That’s a salad about the size of a sofa cushion. Plus 3 cups of fresh fruit. Jeebus! But one cup refers to fresh veggies, the serving size becomes 1/2 cup if cooked. And I can spread them out throughout the day instead of consuming them as one giant salad or pile of fruit. It’s not as daunting as I thought… but most days I do not eat quite everything. I just try to maintain the right dietary mix. After a week and a half on the diet, I ate a traditional American egg breakfast with toast and fried potatoes… and became so tired afterward that I wanted to go right back to bed! No wonder we drink so much coffee and soda pop, we’re just trying to stay awake in spite of the foods we eat. I’m glad to be eating Mediterranean again today. I did not crash midmorning or need coffee in the afternoon, and maintained an even high energy level all day. I didn’t really notice the diet’s effect until I went back to the old way of eating for just one meal. It’s actually quite dramatic. The downside is, it seems I’m always either preparing food or eating! All the grocery shopping and trips to the garden for fresh stuff, and the washing and chopping and snipping of herbs. And even though each meal seems like a lot of food, I am genuinely hungry again in a few hours. It’s a lot like Chinese food that way. And since I’m part of a study, there’s a tracking requirement, which takes time. But I appreciate the “food log” as a teaching tool, and I know that in another week or two eating this way will be second nature. Did I mention the food is delicious? 3 tablespoons of olive oil per day, twist my arm!